Who's your favourite telly couple? What's your stand on marriage? To romper or not to romper? "Fishing" for a pretty blouse? P.S: Stay tuned for GIVEAWAY Wednesday! Have a nice day Diane. oh my gosh - those look amazing! 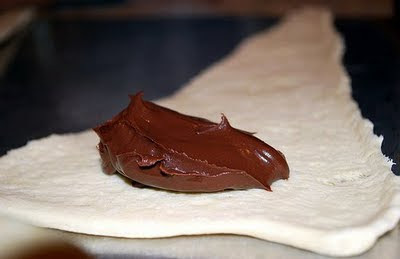 i love nutella! Can't wait to hear about the giveaway! i make these all the time! with frozen puff pastry dough! mmm i want one NOW! First of all, that's such a sweet tradition that couple has, but secondly, HOLY DELICIOUS! I am now officially having breakfast envy! Aww.. did you, Marissa? That is so sweet..Ballerinas are totally amazing. These look fabulous! 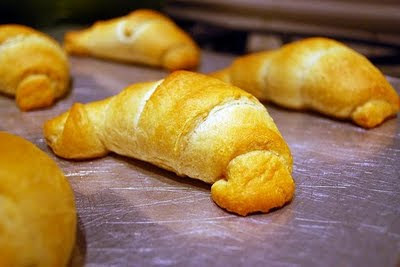 I love croissants and made them several times while I was in culinary school, but haven't attempted them in a while. Just remember to keep your dough and butter cold while your folding and rolling them, that way they turn out buttery, flaky, and moist! ohhh my gosh i am absolutely making those this weekend!!!!!!!!!!!!! i know what i'll be making this weekend. big YUM! oh my goodness! those look sooooo yummy! My boyfriend and I do weekend breakfasts too! It's one of my main blog series! I document our weekend breakfasts too and its a great way for us to connect on the weekends. Oh my goodness these look so delicious!! I am going to have to try these out real soon! oh yummy! i sooo need to make these!! Mandee, that is so sweet. I will check it out for sure! Tara, that is a brilliant tip. Thanks so much!! what a neat idea. 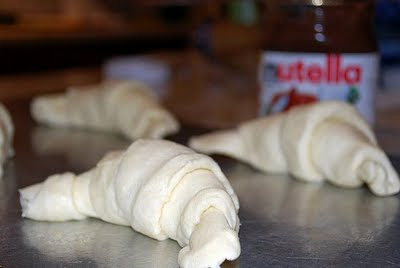 I have a recipe for homemade croissants. I'm still hesitant as the recipe looks very complicated, but I still want to give it a try. we have a sunday breakfast ritual. I make omelettes with lots of veggies, and pancakes. nothing better than a good meal to start the day. you tempt me so much! Brilliant!!! Stealing it! Also you should try nutella bread pudding...I made it for easter and it was such a huge hit. are you kidding me?!!! these look insanely so good i'd die for them!! oh my!! these look too good!! Nutella bread pudding sounds fantasic, MTT. I have to try it! im gonna try this weekend! drooooooling!!! 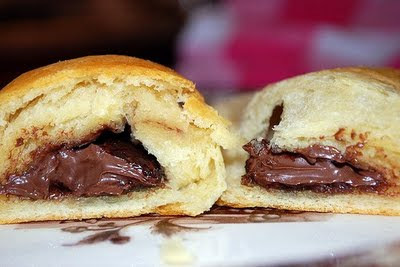 nutella and croissants are two of my favorites so they must be amazing together! Clearly rapture came early because these are my heaven! Ohmy! They look real Delicious!! Those are my favorite treats EVER! I can't wait to try this!! This looks SO good! My sister-in-law is having a French-themed baby shower. This would be perfect! Holy crap...I have to make these. That is my idea of heaven!